May 7, 2010, Greencastle, Ind. — [Download Video: "The Challenge of Diversity" - 377kb] "The challenge for the world is to manage diversity," F.W. 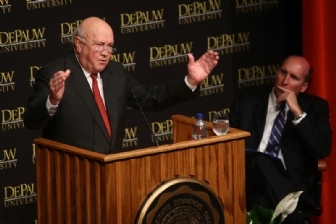 de Klerk told an audience at DePauw University tonight. The former president of South Africa spoke twenty years after he brought an end to his country's racial segregation policy of apartheid. 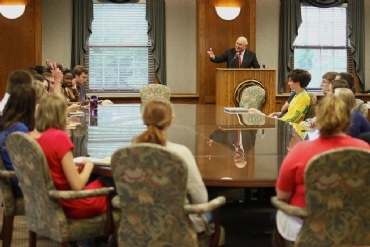 In a Timothy and Sharon Ubben Lecture entitled "In Celebration: The 20 Year Anniversary of the End of Apartheid and the Challenges Ahead," de Klerk discussed our increasingly diverse and complex world and stated, "We hope that we will continue to show the way." 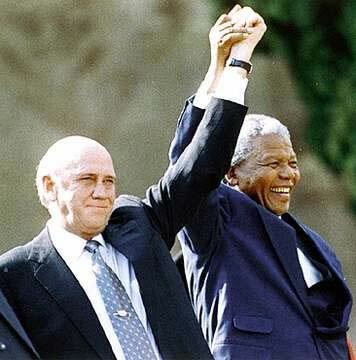 In a speech on February 2, 1990, President de Klerk -- who had only been in office for about five months -- called for an end to the system of apartheid and opened the way for the drafting of a new constitution for his country based on the principle of one person, one vote. Nine days later, Nelson Mandela was freed after spending 27 years in prison. In 1993 the two men were presented with the Nobel Peace Prize. That same year, de Klerk, Mandela and Yasser Arafat and Yitzhak Rabin were named TIME magazine's "Men of the Year" for their efforts toward promoting peace. 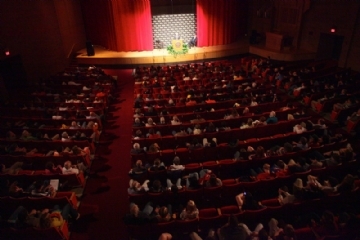 [Download Video: "A Seminal Moment" - 838kb] "Today, this year, is for us a commemoration of a seminal moment 20 years ago, like the fall of the Berlin Wall," de Klerk told the 780 people who braved severe weather warnings to attend his speech in Kresge Auditorium of DePauw's Green Center for the Performing Arts. [Download Video: "20 Years Ago" - 1811kb] "I believe that the historians will regard the beginning of February 1990 as the watershed of South Africa's modern history. There were many events that opened the way to the speech that I delivered to the South African parliament on 2 February 1990. However, the nine days between it and the release of Nelson Mandela on 11 February 1990 changed South Africa forever. Those crucial nine days set the country irreversibly on the road to a different and, I believe, much better future." 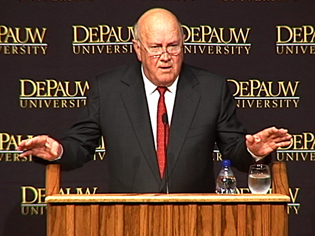 [Download Video: "Seizing Opportunity" - 744kb] "When history opens a window of opportunity, it is important to jump through it," de Klerk said at DePauw tonight. "We knew that the circumstances for a reasonable constitutional settlement would never again be so favorable. So, we jumped. " It was clear apartheid had to go, the former president asserted, and it's the job of leaders to recognize when it's time to change course. [Download Video: "Recognizing Failure" - 1646kb] "Even in your personal lives, in your professional lives, in the life of this University, the first step toward fundamental change is to think analytically where you are and to acknowledge failure where failure has occurred and to accept that you cannot improve a failed project or a failed object. You must turn your back on it and you must substitute a new vision and a new plan." 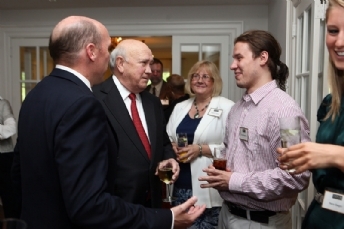 De Klerk spoke at length about the process by which South Africa changed and the crucial role of committed, honest negotiations -- in which all parties are willing to compromise and listen -- in solving disputes. He declared, "The problems of societies divided by conflict can ultimately be solved only by peace. And only when peace is restored in a divided society can the improvement of the quality of life of the people living there begin." F.W. 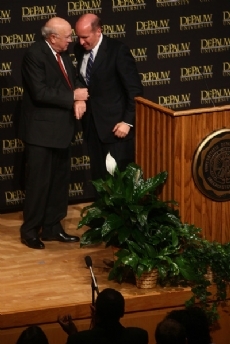 de Klerk was the seventh Nobel Laureate to deliver an Ubben Lecture at DePauw (previous guests were Mikhail Gorbachev, Elie Wiesel, Shimon Peres, Willy Brandt, Leon Lederman and Ferid Murad, a 1958 DePauw graduate). He received three standing ovations from the appreciative audience ( [Download Video: "President de Klerk is Welcomed" - 1322kb]. South Africa, he told the crowd, has come a long way in the last 20 years but still faces many challenges, including an HIV/AIDS epidemic. He believes the dismantling of apartheid could make his homeland "a laboratory for multiculturalism throughout the world." He noted, [Download Audio: "The Lessons of Apartheid" - 532kb] "The reality is that in the new millenium the most serious threat to peace no longer comes from wars between countries; it comes from conflicts between ethnic, cultural, linguistic and religious communities within the same countries. Throughout the world, populations are becoming more cosmopolitan. The world's 200 countries now include more than 6,000 different cultural communities. More than 130 of those 200 countries have cultural minorities comprising more than 10% of their population." But de Klerk was quick to add that there are no perfect nor permanent fixes. "Perhaps the greatest lesson we have learned is that you never really solve problems in human relations. There is no point at which you can clap yourself on the back and walk away from your success. 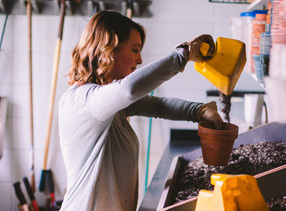 All human relations, including those between communities in multicultural societies, require constant and continuing attention, care, communication and commitment." He added, "Our greatest challenge in South Africa is to keep the miracle of our peaceful transition through democracy -- to keep it alive and successful." De Klerk concluded his Ubben Lecture by stating, [Download Video: "Another Way" - 2000kb] "The best contribution that we in South Africa can make will be to work day and night for the continued success of our complex multicultural society. 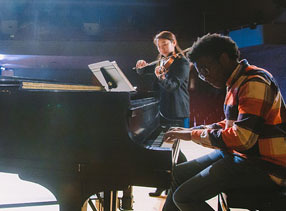 I believe we must continue to show the world that there is another way, that different cultural communities can co-exist harmoniously within the same state, that there is a peaceful solution to even the most complex problems and disputes." 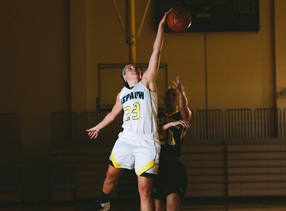 A graduate of Potchefstroom University, de Klerk said he felt "very much at home" at DePauw. 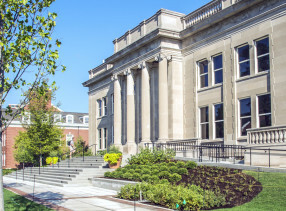 [Download Video: "De Klerk on DePauw" - 1837kb] "I went to a similar university (to) DePauw. We only were 3,000 students. We knew each one by name. We had intimate, small classes where we could interact with our lecturers and our professors." 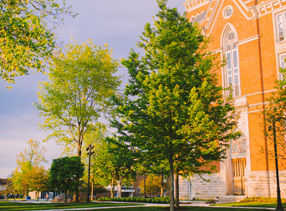 He added, [Download Video: "More on Small Colleges" - 846kb] "I feel like I can really relate to the intimacy which a small, dedicated, good quality university can have on its students. 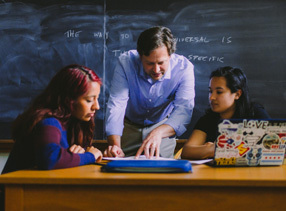 And, in the end, a university is about students." 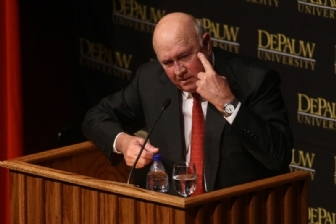 Before he left the podium, de Klerk stated, [Download Video: "Closing Comments" - 2019kb] "I wish this University everything of the best, and I believe you will continue to turn out individuals who will make a difference in this wonderful country which is now the leading country of the world and which we all hope won't deviate from the right course. Because if we lose you as the leading country of the world, if you go too much left or too much right, the rest of the world will be set back for many, many years." 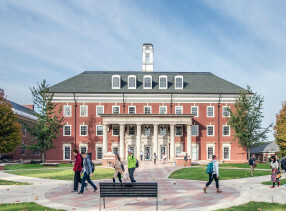 Academy Award-nominee Jason Reitman visited DePauw on March 15, and discussed "Finding Your Way Up in the Air." 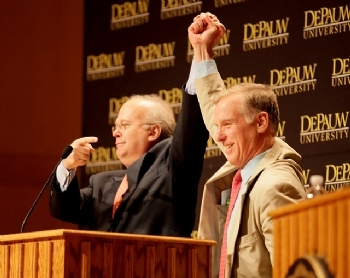 On November 30, 2009, SuperFreakonomics co-author Steven D. Levitt came to DePauw, while the first-ever Ubben Debate brought Howard Dean and Karl Rove (seen at left) to campus on September 11, 2009. Other previous guests have included Tony Blair, Benazir Bhutto, Spike Lee, Margaret Thatcher, John Major, Jesse Jackson, Peyton Manning, Ambassador L. Paul Bremer, Carl Rowan, Todd Rundgren, Paul Rusesabagina, Ross Perot, Mitch Albom, ice cream entrepreneurs Ben Cohen & Jerry Greenfield, General Wesley Clark, Naomi Wolf, Greg Mortenson, Paul Volcker, Doris Kearns Goodwin, Barbara Bush, Ralph Nader, Frank Warren, Harry Belafonte, Paul Tsongas, Mike Krzyzewski, Eric Schlosser, Julian Bond, E.O. Wilson, Liz Murray, David McCullough, Paul Tsongas, Gwen Ifill, Brian Mulroney, Jane Pauley, Ken Burns, George Will, Allen Neuharth, Lynne Cheney, William Bennett and Mary Frances Berry.